Example: Implants placed and restored. The canines or 'eye-teeth' were failing, they were removed, dental implants placed immediately and crowns placed on the implants after healing. Example: Implants placed and restored. Three teeth were extracted, dental implants restorated and immediatley temporized. 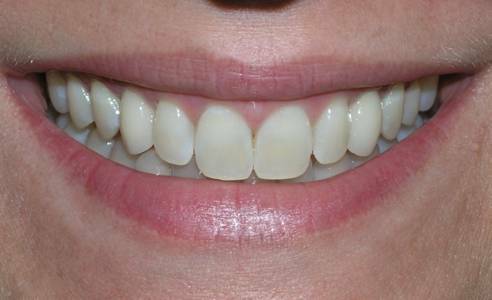 Final crowns were placed later and the result is another beautiful smile! Example: The is a case in which the patient traumatized a front tooth and it was fractured beyond repair. The tooth was extracted, a dental implant was placed immediately, and a temporary was cemented (fixed) to the implant at the same time. Two weeks later, the gums are healing well and a final porcelain crown will be placed after further healing. Please call 636-379-6905 for a complimentary implant consultation.